Nicole Nguyen has earned her Girl Scout Gold Award, the highest award a girl can earn in Girl Scouts. Nicole is a recent graduate of Maury High School and is currently studying at the United States Naval Academy. For her project, “Rising Phoenix,” Nicole reinstated the recycling program at Maury High School and also created an environmental club called at her school. 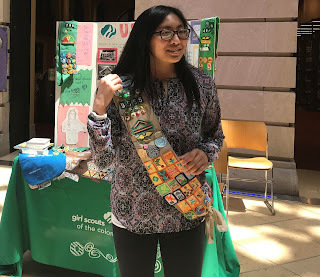 Alongside her club, Nicole raised awareness and promoted a healthy and sustainable environment by holding a Go Green Fair at the Slover Library, volunteering with Measure the Muck and partnering with Keep Norfolk Beautiful. Nicole spent countless hours working on her Gold Award project. Her time was divided among her three main projects. She focused on recycling at her school on Tuesdays and Thursdays with the help of her club. They collected over 670 recycling bins and the group has collectively put in over 291 volunteer hours. The Keep Norfolk Beautiful portion of her project focused on educating the community on how to be environmentally friendly and the various ways they can contribute to cleaning up Norfolk. Nicole’s environmental club participated in Measure the Muck where they collected water samples to test for pollution and also mapped out flooding areas. The group also gained a better understanding of the types and effects of water pollution. All of Nicole’s efforts were driven by the amount of waste her school created and the impact that pollution has on beaches, the air, and cities which can harm animal and human life. Nicole hopes that “by encouraging small changes, like planting seeds, recycling at school, using reusable water bottles etc., people can gradually become more eco-friendly”. Although she has graduated, this project has allowed Nicole to leave her legacy with the students and faculty at Maury High School.